Accounts for the north-east farmers’ co-operative, which is based at the Thainstone Centre near Inverurie, reveal a £2.077m increase in throughput to £126.780m for the year ended December 31, 2018. Trading profit was down to £498,000, from £572,000 the year before, and the group posted a pre-tax loss of £57,000 – this compares to a pre-tax profit of £48,000 in 2017. ANM chief executive, Grant Rogerson, said the group had made progress in a challenging year. He said fixed costs, including business rates, utilities and fuel, had increased and the weather in the back-end of 2018 had an impact on livestock sales. “Our share capital increased significantly through the year and we are very pleased with the support we have received from our members,” added Mr Rogerson. The results included an additional provision of £266,000 for the group’s defined benefit pension scheme, in accordance with additional pension liabilities arising following a recent High Court ruling. Mr Rogerson said the scheme’s £6.155m deficit was a concern, but a recovery plan was in place to bring the deficit to a more manageable level by 2031. ANM chairman Pete Watson, said maintaining stock numbers remained a challenge, but the number of sheep sold through the group’s centres in Thainstone and Quoybrae, Caithness, was up last year, with cattle numbers back marginally by 2%. He said the total value of members’ benefits amounted to £477,000 last year. This included dividends of £143,000, stocking agreement interest savings of £131,000, commission cap savings of £156,000, and enhanced interest rates of members’ loan schemes worth £47,000. Mr Rogerson said the Thainstone Specialist Auctions division enjoyed a strong year with throughput up, while the Aberdeen & Northern (Estates) Ltd division had a record-breaking year selling £20m in rural property. The Thainstone Events division also enjoyed success with a 20% increase in diner numbers at the Porterhouse Steakhouse at Thainstone. 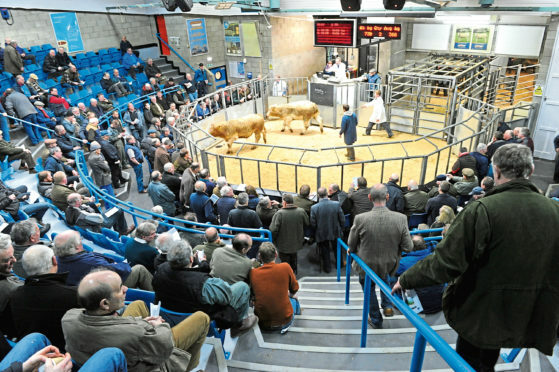 Mr Rogerson said work was progressing on the Thainstone Business Park extension and it was hoped construction work on the long-awaited new Scotbeef Inverurie abattoir, which is relocating to Thainstone, would begin in the summer.